The Rendall Doocot (dovecote) was built in 1648 on the Hall of Rendall estate to house pigeons. 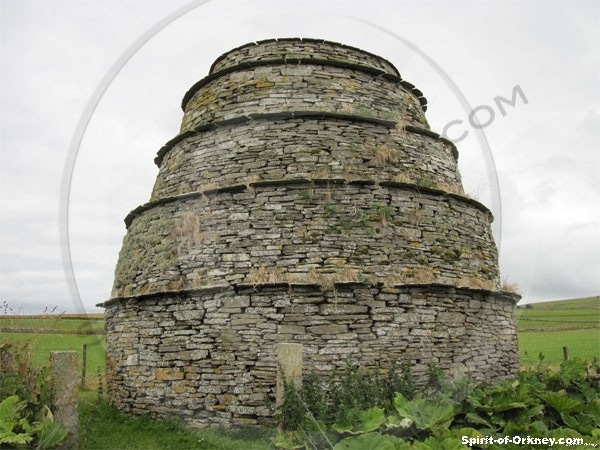 Doocot is the Orkney word for Dovecote and the Rendall Doocot in Evie, is built in the Beehive style, the oldest type in Scotland, built in a cone shape with four string courses of stones or slates protruding from the outside of the four foot thick walls, as a barrier to rats. Doocots or Dovecotes were built to house Pigeons and the evidence of such structures can be traced back to 3000 BC and the 5th Egyptian Dynasty. Normans who introduced them to Britain. Pigeons were kept for the tables of the wealthy and were an important source of food with young pigeons called Squabs in England or Peesers in Scotland, a great delicacy. The ancient Egyptians used pigeons as messengers and in France and the Middle East, their dung was used to fertilise the soil. It is known that their dung was also used to fertilise the Orkney soils. Fewer Doocots were erected after the introduction of Turnips from Sweden in the 18th Century, providing people with a source of food throughout the winter. Birds entered the Doocot through a hole in the roof and nested in the many irregular gaps on the inside of the walls. 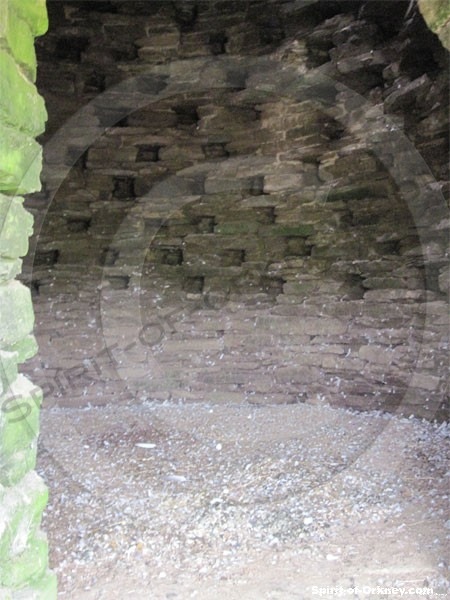 The oldest known Beehive dovecot is in Garway, Herefordshire, UK and dates to 1326. In 1625 Charles I ordained that the floors must not be covered or paved but must be left as bare earth. The dung (high in potassium nitrate) was mixed with black earth to form gunpowder. Most Doocots in Orkney are rectangular or square with lean-to roofs made of slat or stone flags, known as lecterns. Of note are the buildings at Scar House, Sanday and Woodwick in Evie. 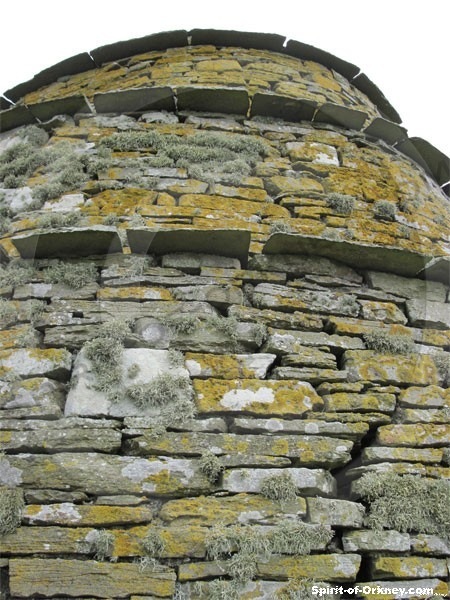 The Balfour Castle Doocot in Shapinsay, which was also used as a shower or douche in the 19th Century is an example of a decorative or drum type, built with an eye to their effect on the surrounding landscape. The British Dovecote Society – Promoting the study, documentationa dn preservation of Dovecotes and Pigeon lofts throughout the UK.